In Winter 2011, the Chicago History Museum launched Lincoln’s Chicago, an exhibition showcasing the city as Abraham Lincoln knew it -- a young, dynamic urban center. Between 2011-2014, a touchscreen kiosk and website were subsequently built to enrich the exhibition, combine a traditional, tangible experience with digital ones, and provide access to our historical content online. In Fall 2011, a touchscreen kiosk was installed in the exhibition gallery to augment the richness of the exhibition by allowing museum visitors to explore images of historic Chicago locations through an interactive journey. 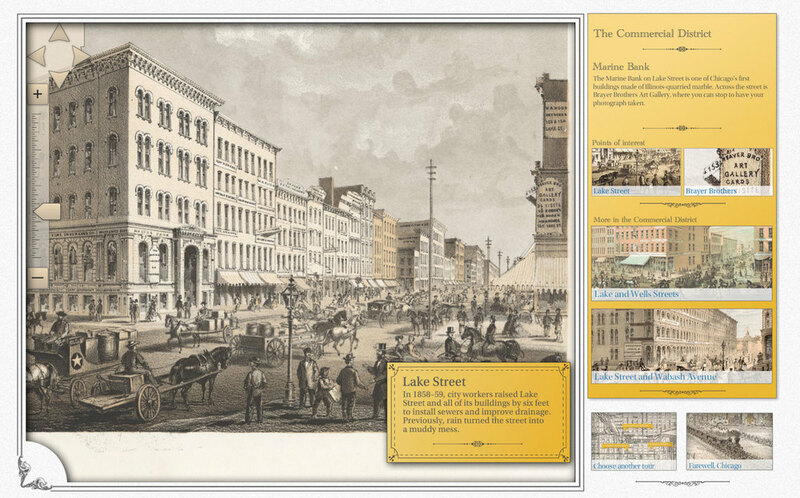 Create a virtual visit to the city’s past. Leverage exhibition’s lithographs and close-up details. Create a sense of “being there” for users. Assisted with design review, user greeting/on-boarding, contextual inquiry, and usability testing. Users begin their journey via train, arriving at Grand Central Depot. Their first destination is Sherman House, a hotel that serves as a launchpad for the visit. While traveling from location to location, the user will examine objects in the scenes to learn additional knowledge. The touchscreen activity will create a user experience that lets visitors re-live an earlier era of Chicago history. An 1863 map of Chicago provides users with a consistent orientation to place and time. Our design review was conducted by two staff members (myself and my supervisor) on the latest version of the application running on the new Dell Windows 7 Professional kiosk computer. Visited tours should be grayed out when they have been visited. Animate the attraction destination copy to capture users' attention that something has changed. We wanted to identify friction points in the activity's design as encountered by a real user in the natural environment of the touchscreen kiosk. Not only was it important to find out if the activity itself worked well, but to know if the kiosk itself was well-suited to the gallery space, or if things like background noise, visitors and school groups, and events in the adjacent room would negatively affect the experience. I took a quick video of the Museum's exhibition environment at closing time to illustrate what the space looks like. Each display window has interactive audio that plays out loud in the gallery when a museum visitor presses a button. Navigation: Are users able to easily decide on a tour? Explore, move, zoom-in and out of images? Move from one tour to another? Exit the activity? Readability and Comprehension: Do users struggle to read copy? Identify and understand instructions and content? Notice dialog boxes? Fatigue: Does the position or dimensions of the kiosk cause physical strain? 3/5 users did not immediately find the zoom controls, 4/5 learned about the zoom functionality and were pleased with it. 3/5 users tapped this element, it does nothing. The Sherman House marker blends in with the rest of the markers, but it is not part of the tour. It is the “launch pad/you are here point”. 3/5 users selected it on the map and did not expect to return to that screen. 1/5 users had a difficult time remembering what tour they had already visited, when selecting a new tour from the menu. Technical Bug: The cultural attractions tour description copy was appearing outside of the cultural attractions tour e.g. it appeared in the waterways and South Side tours.